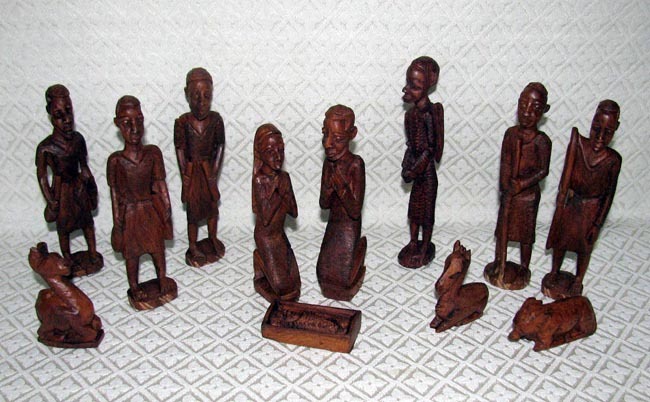 This Nativity was hand-carved from mahogany wood by Josephy Banda in Blantyre, Malawi. The figures have very detailed facial features and etched clothing. The set contains twelve figures: Joseph, Mary, baby Jesus in a manger, an angel with carved wings, two shepherds, a camel, an ox, a sheep, and three kings with gifts. The standing figures measure approximately 6 inches tall. In addition to being a carver, Josephy is also a talented painter of African and religious scenes. He sells his paintings and carvings at a morning market that happens monthly. During the summer his work is sought after by tourists on the shores of Lake Malawi. Please note that each set has some carving style variation. $90. Please click here for purchasing instructions.